The pair have captured the imagination of the cycling community. When Kingsley Fiegert was attacked from behind whilst riding his bicycle, he got thinking: this isn’t right, there’s got to be something I can do about this. Partnering up with Andrew Hagen, they put their minds together and came up with the briliant idea of making an all in one rear facing light, and camera. The result, the Fly6. Why the name? Fly, like a ‘fly on the wall’, or simply being ‘FLY’ (as in cool), and the ‘6’, a nod to the direction of the camera. When Andrew and Kingsley hit the crowd funding generator, Kickstarter, they were inundated with support. So much so, they smashed their target by almost three times, to well over $266,000 AUD, and immediately went into production. Clearly the pair have captured the imagination of the cycling community. After all, an idea this good shouldn’t be just for the Australians! We had seen a couple of videos of cyclists in Australia enjoying the benefits of the Fly6, from: group rides, near misses, and people jumping off bikes and landing on their feet again. So you can imagine, this attracted us to the host of possiblities the Fly6 could offer us on both commutes and Sunday morning adventures. Not knowing where or how to get our hands on a Fly6, but wanting to help raise it’s profile, we set up a ‘wish page’ of what Andrew and Kingsley have created, in order to share it with our growing cycling community in the northern hemisphere. After all, an idea this good shouldn’t be just for the Australians! The Fly6 sits comfortably in the hand, but bikes with traditional geometry, and low seat-posts may have to tweak it a little. UPSIDES: The Fly6 really works well as a rear light. By far the brightest and most noticeable of the rear lights out of the group of riders I regularly head out with. It is also noticed a lot by other riders enquiring about the size etc. The others are quite impressed that there is a camera in there as well as the light. Battery life is pretty good given that it is not only powering the LED’s, but also the camera. Despite riding through Singapore’s worst downpours, the usb and card ports have remained totally dry. DOWNSIDES: I have only had 3 rides with the camera functioning correctly. On all other occasions I have returned from my ride to find I only have 5 mins of camera footage. Support has been good and all of my emails have been responded to by Kingsley on the same day. I have been advised to reformat the memory card which resolved the problem for the next outing and then the problems returned. I have reformatted the card twice since to no avail. I am now going to try a new memory card as a last resort before returning the unit. I will keep you posted. Quality of night time imagery is not so great and given that about 50% of riding in Asia is at night (cooler) it would be beneficial if this could be improved. I put the faulty performance down to being just one of those things and it may just be a faulty memory card at the end of day, which is not Fly6’s issue. Overall, when its working its an excellent addition to the cyclists arsenal! The advantage of having a camera pick up what you can’t see is priceless. – Picture quality during the day has really impressed me. Footage is clear, adequately sharp, smooth and most importantly good enough to make out a license plate of a vehicle in close proximity. – Battery life has also been good especially considering there’s a camera inside! A full charge on the fly 6 outlasts my rear lezyne light. 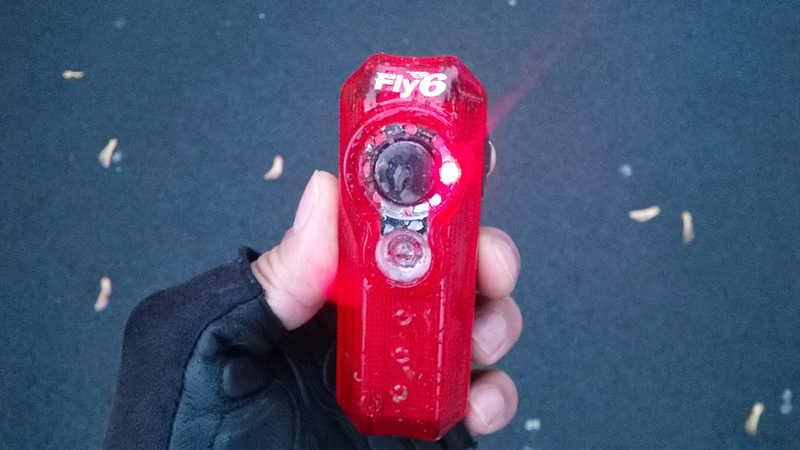 – The various light mode options seem to be effective and I noticed that many cyclists notice the Fly6 immediately, by looking straight into the camera : ) Hopefully this means the light is as equally visible to motorists. – The size is a little too large for my liking. As I have a short seat post it’s difficult to find space for my clip on mud guard. If the light was a little smaller but made up for this by being even brighter it would be perfect! Or perhaps smaller version could be added to the range that could be easily clipped onto a backpack? – Night footage has been a little disappointing (but at least details like license plate numbers can be made out). Video can get quite juddery and is a little too grainy/noisy. Overall I’m very happy with the Fly6 and have been really impressed with the results. If the night footage can be improved and if the device was a little smaller I think it’d be perfect! protection from hit and run accidents, combined with a front light you would feel protected. With a smaller version already in development it is going to get better as well. Honestly I think fly6 is okay. Holds battery well, effective flashing pattern, solid build, easy on off, versatile, not really heavy. For the commute its good as a light. I haven’t looked at any of the footage yet but it’s nice to know it’s there. It is bulky and tricky to turn off/on but I’m using it over my old cateye! To be honest I haven’t used it. I think it is a great idea and is functional for what it does, but the downside is that it is a bit big and my legs would hit it. It’s a great bit of kit. Easy to set up and functions well. Footage is good quality. Only slight gripe is the overall look which is a bit ‘chunky’ and the fact that it automatically deletes footage on a loop lasting about 2 hours so its fine for most commuting distances, not so good for longer group rides. I was using the fly6 every day on my commute. I liked it a lot although there are some things that could be improved. As I think I said before, it only just fit on my steamroller because the seat post is relatively short. I suppose a lot of people have compact frames these days and therefore longer seat posts. If there was a way of making it slightly less chunky in design, I think that would be a good thing. I used it in the dark a couple of times and didn’t think it performed that well. It was very difficult to make out number plates on cars, which might be important if you actually had an accident! Excellent feeling of security. Luxurious packaging. Intuitive interface. Good microphone. Love that you can take it off the seatpost midride and use as an impromptu handheld camera for the film-makers in the team. Easily fitted, no fuss. Film quality is more than up to the job. Easy to take off. Not so easy to put back, but that’s just me shooting mid-ride. Four Stars: The Fly 6 is revlutionising the way we think about road safety and design. It does both very well, and although this is their first product, Andrew and Kingsley continue to express that they’re not at all satisfied yet, and there’s room for improvement. Which is a good thing for us. For now, they’ve taken all the best things from a good light – loads of settings, and lets not forget, a camera – wide agnled, water repelent, long lasting battery life, that turns into a good friend to have on a ride. And a Wish: Now that I’ve got a rear facing camera/light, I want one that can do the job up front too; on my helmet; or on my body; which I can pull off and use in my hand whilst riding and still record with ease. Yes, there are many players already in the market, but coming late to the party can also bring with it experience and opportunity. I for one really hope the gents come to the party and have a bash! According to people who attended the EuroBike 2014, the dynamic duo have quickly taken in feedback from customers. The current update boasts a more compact design, longer battery life, increased lumen output and HD quality. Six months into bringing their first device to market, Andrew and Kingsley are at it again. As soon as we can get an updated Fly6, we’ll be sharing our thoughts with you. For all the latest information on products and goals of the company, head over to Fly6. You can now purchase the device online through JeJamesCycles for £115. We’d like to thank Andrew and Kingsley for giving us the opportunity to work with them: raising awareness and helping make cycling on roads a positive experience . Here’s to everyone enjoying a safer and tremendously more enjoyable ride! No mention regarding a removable battery, which is a huge disadvantage. This limits the life of the unit to the charge-recharge life of the fitted rechargeable battery, which isn’t great. I like the general concept and I’m currently looking to purchase a rear-facing camera (hence my interest). However, bearing in-mind the other negatives, and the fact it isn’t environmentally friendly, this one’s a definite no-no for me. This is true, we are limited to the life of the battery, and this is precisely why I’ve never had an i-phone, but this doesn’t stop the thousands queuing outside their stores. I guess it comes down to the quality of product and manufacture. My 4yr old Exposure light works tirelessly throughout the year, with no noticeable change in it’s energy levels or output. We’ll be posting updates on how the the camera/light works, and it’ll be particularly interesting how it holds out in the British seasons. I’m really interested in Fly-6 latest version. I want to buy 2 of them , one for front and one for rear. Is it possible to have a camera as a module ? because I can’t mount in front as a camera due to bliking red light and also to be use as the light for the rear , it is only 30 lumes. So for me light feature is not that useful.